Is your AC making ominous noises? Maybe it sounds fine but isn’t cooling. 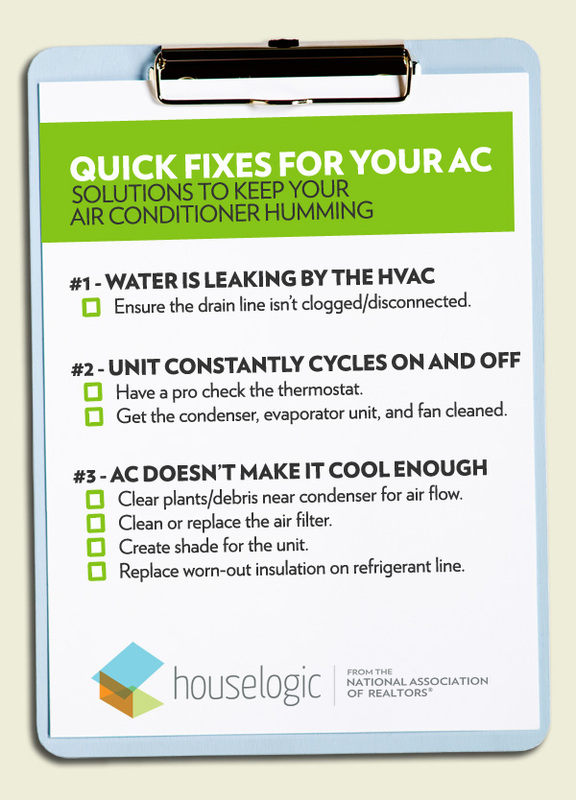 Here’s a list of common air conditioning warning signs and their likely causes and fixes. Air conditioning and HVAC units don’t last forever — 12 years is an average lifespan — and the moment they fail is usually when you need them the most. The good news is that not every system malfunction spells total doom. Many nuisances are so cheap and easy to fix, you’ll kick yourself for not doing them sooner. Outdoors, make sure there’s at least 24 inches of clearance on the sides and 5 feet on top of the unit. Also, check to make sure there are no obstructions to the home’s cold air returns and registers. Possible cause: A spike in operating costs typically signals inefficient operation. After a dirty filter (warning sign #2), the most likely culprit is a choked condensing coil. Located within the outdoor unit, the coil has countless cooling fins — much like a car radiator — that can accumulate dust and debris. Cost: Free if you’re handy (and plan on reusing the same unit); up to $250 for a new programmable unit, plus another $90 for an electrician to install it.